All in new tablet size smaller, easy to take, 180 count bottle. Belly-Ease™ Chewables your total digestive solution. New formula improved. New tablet size to help delivery more enzymes and probiotics. Probiotics - With 12 different live stable strains and Now! 2 Billion Probiotic CFUs Per serving. Great taste children love them. Modern day lifestyles and eating habits are contributing to a startling decline in the quality of nutrition that we are able to absorb. A growing number of people are faced with health issues as a result of questionable nutrition from fast food dining and junk food snacking. Others may also have problems with nutritional deficiencies related to insufficient food consumption or a diet with limited variety. All of us need to eat fresh fruits, fresh vegetables and lean proteins, but this does not always happen. Also many lifestyle factors are killing off our natural balance of intestinal flora, called probiotics, which further inhibits our system from even getting the nutrition from the food we eat. Now with an outstanding 12 different live stable probiotic cultures not only helps digestion, but also strengthens the immune system. Whole food Vitamin C and Chelated Zinc complete the immune support. Science supports that an important first line of defense in immunity is intestinal flora. Belly-Ease chewables supplies two Billion CFU's (in a single tablet) with two of the most important stabilized strains of "live good guy" bacteria, Lactobacillus Acidophilus DDS-1 and Bifidobacterium Bifidum are specifically chosen for their special benefits to the immune system and digestive tract and 10 new probiotics. Two Belly-Ease™ Chewable tablets with each meal will increase the bio-accessibility of all the nutrients in the food consumed thus insuring the maximum nutritional benefit. Protease 4.5 , 6.0 , 3.0 and Peptidase- proteases refers to a group of enzymes whose function is to break down proteins; they are also referred to as proteolytic enzymes or proteinases. The proteins are broken down to their basic building blocks - amino acids. In order to have the amino acids available to the body, these enzymes have to break down the proteins to free them. This important compound is the key to digestive health. Belly-Ease™ Chewable Chewable formula contains three different proteases. Amylase - amylase refers to a group of enzymes that breaks down sugars and starches. They are required to digest carbohydrates (polysaccharides) into smaller units (disaccharides), and eventually converting them into even smaller units (monosaccharide) such as glucose. PA-L ® - Vegetarian alternative that mimics pancreatin, with lipase. Diastase - diastase is an enzyme that is the catalyst in the hydrolysis of disaccharide maltose to the simple sugar form – glucose. When starch is eaten, it is partially digested and transformed to maltose by both the saliva enzymes and pancreatic enzymes called amylases. The maltase secreted in the intestines converts this maltose into the usable sugar, glucose. The glucose can be used immediately or stored in the liver for future use. Lipase - lipase is the enzyme required to break down fats and lipids. In order for fat to be digested properly, the liver must first start the process by emulsifying the large fat molecules. Then bile breaks them down to small droplets, allowing the lipase to start its work. Glucoamylase - glucoamylase is used to breakdown carbohydrates, specifically polysaccharides. Invertase - invertase this enzyme breaks down carbohydrates, especially sucrose. Cellulase and Pectinase - Help digest protein molecules. Four varieties of protease enzymes have been combined in this formula to compensate for higher protein diets. Phytase, Hemicellulase and Xylanase - Specifically help with releasing fiber-bound minerals from plant sources. They have been included to aid in the digestion of herbal supplements. They are also great for vegetarian diets! NEW! Exopeptidase, Dipeptidyl peptidase-IV - It seems reasonable that if supplemental DPP IV and DCP 1 were ingested in conjunction with a gluten containing food, the protein could be efficiently broken down prior to the entrance into the small intestine. ProBiotics are organisms and substances that help improve the environment of the intestinal tract. These organisms produce acids (such as acetic acid and lactic acid) and other compounds, which inhibit the growth of "bad" bacteria and promote “good” intestinal flora. Lactobacillus Acidophilus DDS 1 -researched and developed by Dr. Khem Shahani over 77 years ago, has been, and still is, the most effective probiotic strain. Acidophilus defends against the greatest number of pathogens, inhibiting the growth of bad bacteria. Called the "sticker strain," Acidophilus has the ability to actually cling to the intestinal wall without harming it. In fact, it is best known for its ability to move undisrupted through the stomach and into the intestines where it eats away at harmful bacteria. It is known for reducing the occurrence of occasional constipation and diarrhea, increasing nutrient uptake (especially calcium) and supporting healthy skin conditions. L. gasseri – NEW! - A number of clinical trials and animal-based studies suggest that Lactobacillus gasseri may help reduce abdominal fat and support weight loss. L. Reuteri- NEW! Although L. reuteri occurs naturally in humans, it is not found in all individuals. Therefore, dietary supplementation is needed to introduce and maintain high levels of it in some people. Oral intake of L. reuteri has been shown to effectively colonize the intestine of healthy people; colonization begins rapidly within days of ingestion, although the levels in the body drop within several months after intake is stopped. Furthermore, L. reuteri is found in breast milk, and oral intake on the mother's part likewise increases the amount of L. reuteri present in her milk, and the likelihood that it will be transferred to the child's body. Once present in the body, L. reuteri benefits its host in a variety of ways, particularly by fighting off harmful infections and mediating the body's immune system. Whole food Vitamin C - from Amla Fruit, also known as Indian gooseberry, is one of the richest natural sources of bioflavonoides and Vitamin C. Native to India, the plum sized fruit is revered for its anti-aging and immune enhancing properties. Even the foods we eat to keep healthy, like meat, poultry and milk, often contain antibiotics that further reduce the levels of good bacteria. For most Americans, this means every day we negatively influence our bodies' ability to stay healthy. So we need to take probiotics every day. 1. How do I use new Belly-Ease™ ( formally know as Ultra-Enzyme Support ® PLUS) properly? New Belly-Ease™ Chewable should be taken with every meal. Chew 1-2 tablets, depending on the complexity of the meal and the size of the meal. Belly-Ease™ Chewables should be taken just before or during meals, for help with stomach related symptoms like gas, heartburn, acid reflux, water retention, bloating, fatigue, etc. 2. What type of research is behind the Belly-Ease™ Chewable? Belly-Ease™ Chewables combines the latest research and clinical studies into one powerful formula. 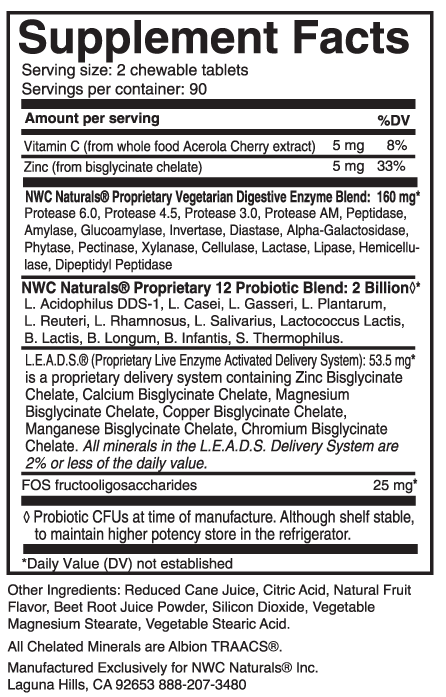 The probiotics in this formula were selected after consulting with Dr. Khem Shahani from the University of Nebraska. Dr. Shahani was recognized as the world’s foremost authority on beneficial bacteria supplementation and was a pioneer in the discovery of DDS-1 Acidophilus. Now with more digestive enzymes and probiotics to make the total digestive support we need. 3. What can I expect to feel after taking this formula? People suffering from gas, heartburn, bloating, cramping, fatigue after eating or cravings, may expect these symptoms to diminish after just a few weeks of taking this formula. Other enzyme deficiency related conditions will improve over time depending on the individual. You should notice significant improvement of these conditions within 2-3 weeks of taking the formula faithfully. 4. What is the difference between plant and animal based enzymes? Plant-based enzymes are derived from many sources including pineapple, papaya and vegetarian based fermentation. Animal-based enzymes are extracted from the pancreatic tissue of slaughtered pigs and cows. The high pH environment of the small intestine is the only place animal-based enzymes can function, as they are extremely sensitive to low pH ranges. This means that animal based enzymes may not survive outside of this environment. Plant-based enzymes are not destroyed by the acidic conditions of the stomach and, therefore, are stable in the upper stomach where they can begin processing food immediately. NWC Naturals will never use animal-based enzymes from the slaughterhouse. 5. Can I take Belly-Ease™ Chewable while I am on medication? This formula has not been shown to interact with any medication. However, if you have any specific questions, please direct them to your physician. 6. Are there side effects with Belly-Ease™ Chewable? When taken as directed, there are no known side effects with this formula. 7. Can I give Belly-Ease™ Chewable to my small children? Yes. If they are too young to chew tablets, you can crush the tablet and put it into some food. Any cold or room temperature food or beverage will do. Remember heat and cooking destroys enzymes and probiotics. 8. I already take a multivitamin, why take this formula in addition? Multivitamins provide general nutritional support to the body, but only, if you have enough good bacteria in your body to allow for absorption. Belly-Ease™ Chewable uses 12 different strains of probiotics to help clean your system of toxins and improve nutrient absorption, plus the 19 enzymes to digest and deliver the nutrition from your food.